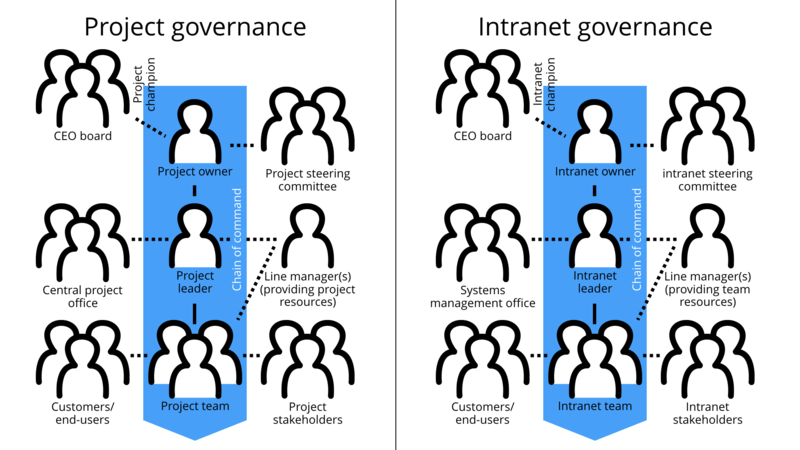 Recently I had the opportunity to meet some 10+ intranet managers for a discussion about intranet governance. A really interesting fact in this group, consisting of both municipal, regional and governmental organisations as well as commercial business, was that almost no one felt they had a clearly designated intranet owner for the existing intranet. Many had, at some time, been in an intranet project (as project leader or project team member) with a project owner and an appointed project steering committee. But when the new intranet was delivered and the project ended, the new intranet was often not handed over to any kind of governance functions. Instead, the intranets now exist in a kind of limbo, with no clear governance structure. …are missing, or are at least a lot harder to find (because you don’t have an intranet owner). Sometimes an organisation makes it really difficult the other way: There are ten obscure steering committees on different levels in the organisation, you have portfolio management and matrix management, and there are several different stakeholders, all of them believing that they all singlehandedly govern the intranet. But it doesn’t has to be like this. Actually, a really good way to get some decent intranet governance running is to copy-paste the standard project governance model. By re-using the basic, universal project governance model, you get all the important basic roles/functions in your intranet governance. A team of experts, a team leader as well as product leader, an owner and a CEO level champion. Sometimes owner and line manager(s) providing resources is the same person. Sometimes the owner is also the champion. And you handle both important stakeholders (e.g. having them in the steering committee) and ordinary stakeholders (the intranet team manage the dialogue). What tasks should the team, the intranet team leader and the intranet owner do? Check out The Intranet Governance Game for answers! Four cards from The Intranet Governance Game, belonging to the Intranet owner.